This is our response to the challenging efforts of keeping ALL Emergency Services safe and provide a level of protection the same as our Law Enforcement WITHOUT having to mimic the look of Law Enforcement or a SWAT/Tactical Team. The OSS Fire Rescue Rig is designed to mimic the typical Turnout Coat worn by all Fire/Rescue. This rig is designed to distinguish between a Police response and a Fire/Rescue Response. Although both need the protection level on Active Shooter scenes, they have much different responsibilities and functions be it assigned to an outside perimeter awaiting an all clear or inside a hotzone with Law Enforcement actively treating victims. The typical armor response gear being worn by Firefighters, Paramedics and EMS typically mimic a Law Enforcement Officer. 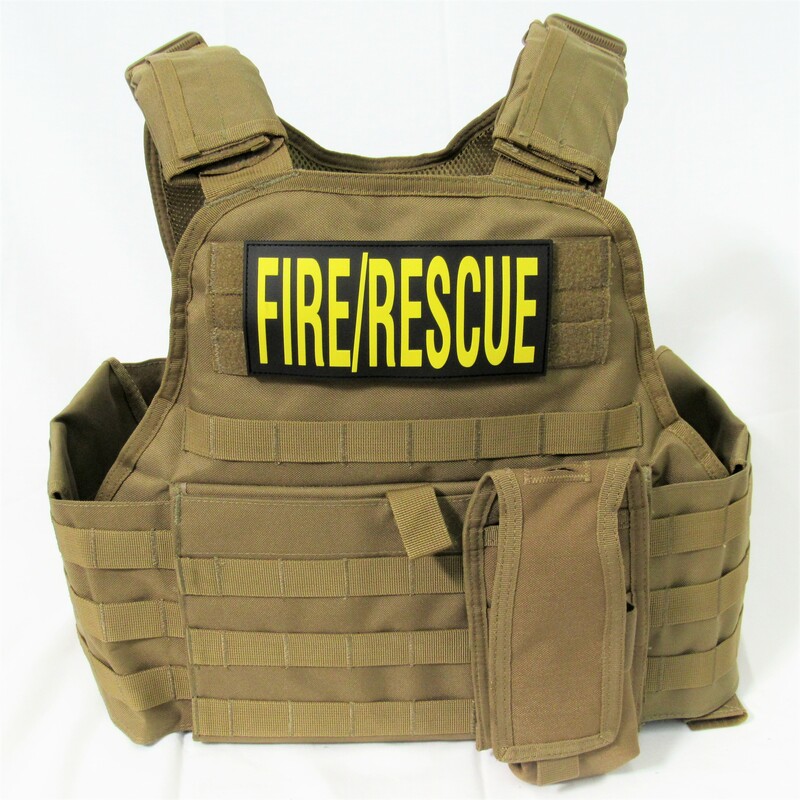 Now with the OSS Fire/Rescue Armor Rig, Firefighter and EMS can remain as being seen as a medical response and "NOT", SEEN AS UNARMED LAW ENFORCEMENT. In a suspects psychological state he may be inclined to take out the easy targets if afforded the opportunity and a Firemen that resembles a Policeman due to the similar color and style of uniform and external armor carrier, is seen as an easy target because they are visible unarmed. The Rig itself is a Full Coverage Carrier w/ Cumberbun system that can accomodate 6x6 or 6x9 side armor plates. It is a very comfortable and supportive carrier with molle system on entire front and rear for any attachments you may need. It comes with a Radio Pouch and shoulder pads. It has quick 2" snap shakle buckels on the shoulders for a Rapid Removale if needed. It is completely adjustable to fit most sizes that range from S - XL. It comes with our OSS Level IV, NIJ 0101.06 armor plate that is comprised of the most advanced ballistic ingredients on the market (patented). These armor plates are a stand alone, multi hit, 10x12 SAPI/ESAPI plate with a single curve to provide a level of comfort along with the peace of mind knowing you have the strongest plate to date and onlyIt is 6.9lbs. It is comprised of Monolithic Ceramic and Polyethylene to provide the ultimate strength at a lighter weight than most other plates available today.